Another canned beer coming from Tallgrass Brewing is hitting shelves in Eastern Iowa this week. 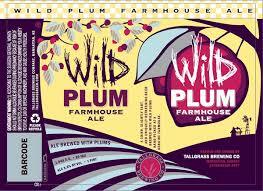 Going with a unique Wild Plum Farmhouse Ale and like all their other offerings it will be coming in a can! Here’s the release courtesy of Tallgrass Brewing’s website: www.tallgrassbeer.com. Wild Plum Farmhouse Ale is a crisp, slightly tart, and uniquely refreshing beer. An infusion of wild plums, hand-picked at a genuine farmhouse, gives this beer a light tangy fruit flavor. The perfect summer companion. Farmhouse ales are also known as “saisons” (French for seasonal), a style of summer beers traditionally brewed by Belgian farmers to serve farm workers as part of their wages. Not a bad deal, if you can get it. Wild Plum is available each summer, June through July. Really enjoyed this one. Very refreshing, mild plum notes.